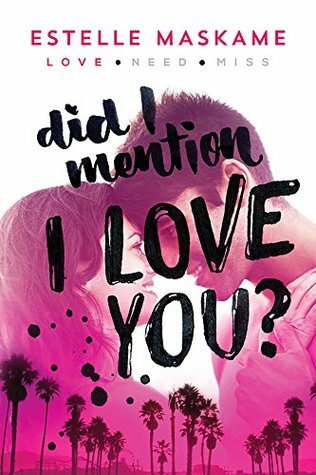 ARC Review: Did I Mention I Love You? Eden Monroe came to California for a summer of sun, sand and celebrities what better way to forget about the drama back home? Until she meets her new family of strangers: a dad she hasn’t seen in three years, a stepmonster and three stepbrothers. Eden gets her own room in her dad’s fancy house in Santa Monica. A room right next door to her oldest stepbrother, Tyler Bruce. Whom she cannot stand. He’s got angry blue eyes and ego bigger than a Beverly Hills mansion. She’s never felt such intense dislike for someone. But the two are constantly thrown together as his group of friends pull her into their world of rule-breaking, partying and pier-hanging. Did I Mention I Love You? is the addictive first book in Wattpad sensation Estelle Maskame’s DIMILY trilogy: three unforgettable summers of secrets, heartbreak and forbidden romance. I’ll admit it. I was excited for this one. If I was going to have a guilty pleasure read, this was going to be it. I was looking forward to something definitely along the lines of Kody Keplinger’s A Midsummer’s Nightmare and, okay, maybe a tiny bit of Clueless. However, Did I Mention I Love You? was like neither of those stories. I recently learned about the term “train-wreck syndrome” in use with novels on another book blogger’s blog (I unfortunately do not remember which blog it was said on or I would credit it). It’s when the book is horrible, but you can’t leave it for some reason and still tear through it. This is what this book was to me. I read the first third of the book and wasn’t liking it. I really just need to learn to DNF books already, but I’m not there yet and I continued on with this one. Albeit, I skipped the second third of the book, skimmed several parts, and then read the last few chapters. Now, here’s where the train-wreck syndrome novel comes in, I went BACK through the book and read what I originally skipped. I’m a mess, I know. This book frustrated me and not in a good kind of way. The characters annoyed me to no end. Not only could I not relate to the main character, Eden, I didn’t want to relate to her. She makes terrible, stupid decisions and she doesn’t even learn from her mistakes. Some tough topics are discussed in this book, which is good. What I don’t like, though, and what really made me angry? Eden having an eating disorder. And it not being touched on. Not. Even. Once. This is unacceptable to me. In the society we live, there is way too much pressure for girls to have a perfect body as it is. For such a serious topic to be brought up and just left there? I’m not too harsh of a critic, but that’s where I draw a line, and I cannot, will not, let this slide over it. This is just too harmful for girls. Maybe I’m overreacting, but I do not care. This subject deserves some overreacting. Overall, I am unhappy and disappointed with this read. I cannot recommend this book, and I will not be continuing on with this series. Sorry to hear this! But I liked this phrase “train-wreck syndrome”, good to know 🙂 Thank you for your honesty! Thanks! It’s always hard reading books and then writing reviews for them when I didn’t enjoy them.